Pennywise is back, ladies and gentleman because the first trailer for IT is here. Yes, after years of talking about a possible big-screen adaptation of Stephen King's famous horror novel about a killer clown that likes to kill kids, this trailer makes it clear that IT is very much a reality. And IT is coming for us this fall in what looks to be very terrifying fashion. 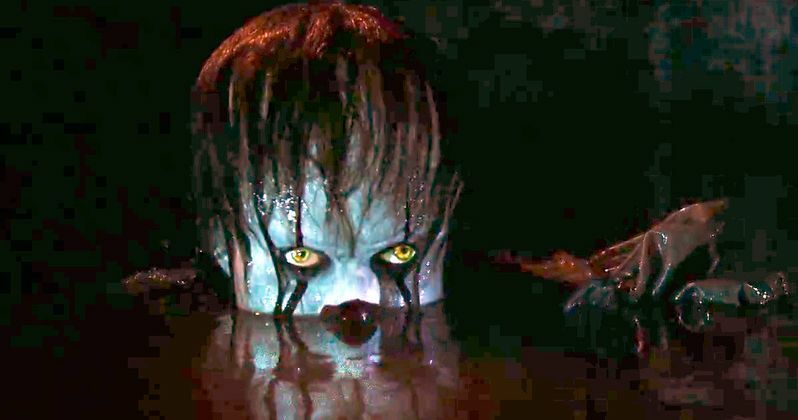 Warner Bros. has been releasing a steady stream of images from this new adaptation of Stephen King's IT for months now, but they have finally done horror fans a favor and dropped this first trailer. Some lucky fans at SXSW were treated to a trailer reveal and the response from those in attendance made it clear that this movie was going to be straight-up scary. People have a fondness for the TV miniseries that more or less serves as a movie that starred Tim Curry in the role of Pennywise the clown, but this looks to be much darker. "Based on Stephen King's best-selling novel. A group of young kids face their biggest fears when they seek answers to the disappearance of children in their hometown of Derry, Maine. They square off against an evil clown named Pennywise, whose history of murder and violence dates back for centuries." Director Andres Muschietti and producer Barbara Muschietti both started teasing the release of this first trailer for IT last week on Instagram. Andres Muschietti posted a photo with some creepy looking balloons on it, seemingly signifying a countdown of some kind. Barbara Muschietti decided to post a picture featuring Jack Dylan Grazer and Wyatt Oleff with a caption that read, "What is 22 + 7?" It is unclear if it was always the plan to release the trailer now, but given the positive response to what screened at SXSW, it is possible the studio gained a little more confidence and decided to get the marketing train really rolling. We have had to wait a very long time for this IT movie to happen and everything we have heard, and now seen, makes us think that the movie will be worth the wait. Not only has Stephen King seen the movie and gave his glowing approval, but the studio is already moving ahead with the sequel, which could start filming any time now. According to the producers it has always been the plan to split IT into two movies, one focusing on the protagonists as kids and one focusing on them as adults, much like in the book. However, if the studio didn't feel confident in the final product, they would maybe be hesitant to move forward so quickly with IT 2. Bill Skarsgard leads the cast of Stephen King's IT as Pennywise the clown. The cast also includes Jaden Lieberher, Finn Wolfhard, Jack Dylan Grazer, Wyatt Oleff, Chosen Jacobs, Jeremy Ray Taylor and Owen Teague. IT is being directed by Andres Muschietti (Mama) and is set for release on September 8, 2017. Be sure to check out the very first, terrifying trailer for yourself below.